Remember having a great time on the playground back in school? 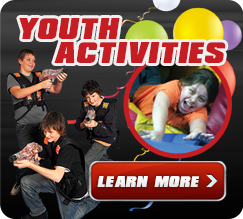 Want to have a blast simply playing games on our various sports fields and courts? The SC Playground is the Attraction for you! Our staff will provide equipment for activities such as Dodgeball, Wiffleball, Soccer, Basketball, etc. You get to decide what you want to play. The SC Playground is $8.95 Monday-Thursday and $9.95 on Friday, Saturday, and Sunday!